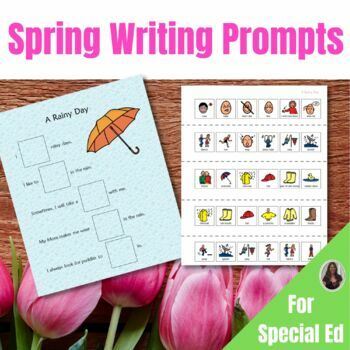 This product contains 15 different writing prompts (all with a spring theme) in color and BW. 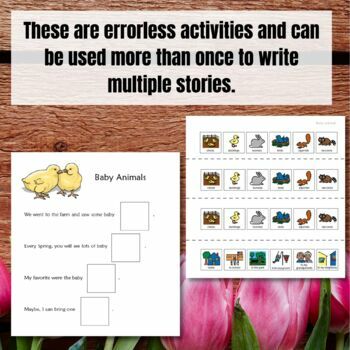 They were specifically developed for students with autism and significant learning challenges who are in elementary school, and may be either non-readers or emerging readers. 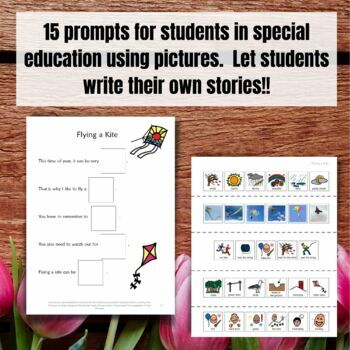 Having students create their own writing product can be super challenging when teaching students with special learning needs. This method allows them to create their own story using the structure provided and some appropriate pictures to choose from. In addition, there are teacher suggestions on how to make the most of this activity included. For even more tips on teaching students to write who truly struggle with reading, go to my blog post, Writing Prompts for Students who Cannot Read. 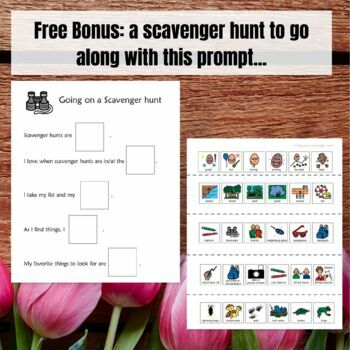 There is even a FREE prompt you can get there to see if this will work for your students. See preview for a more detailed look at contents. ♥I am currently developing more units, and any feedback I get helps me make improvements in the future. Please consider checking out my other literacy units by clicking on the literacy unit tab to the left in my store.